Warning: This image can only be reused if a valid SEO link is provided in return, see 'Terms and Conditions' for more details. Any other use of the image will be strictly prosecuted and enforced. 00000200-sign-shem-and-ever.jpg‎ (500 × 338 pixels, file size: 106 KB, MIME type: image/jpeg). This image is also available in a larger size without the logo. To use any of the Zissil photo stock images and pictures for print media please contact us. Sign above the entrance of the Cave of Shem and Ever in Safed. 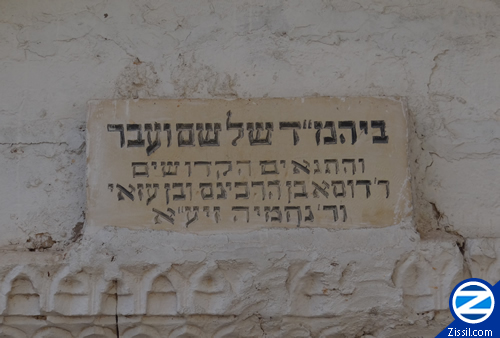 Sign say that it is also the Kever of Rebbe Nechemia and Rebbe Dosa ben Hurkanes. The Arizal verified that only ebbe Dosa ben Hurkanes is buried in the cave.